Can’t fault this hotel in any way whatsoever- great rooms, great style, great breakfast, great location, lovely pool/spa area too! 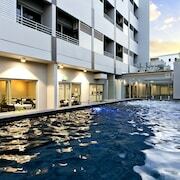 Located in the heart of Darwin, this aparthotel is steps from Darwin Entertainment Centre. 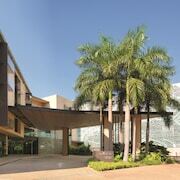 Located in Darwin City Centre, this luxury hotel is within 1 mi (2 km) of The Esplanade and Darwin Waterfront. Cullen Bay Marina is 1.7 mi (2.7 km) away. 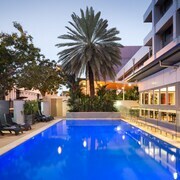 Located in Darwin City Centre, this hotel is within a 5-minute walk of The Esplanade and Darwin Waterfront. Cullen Bay Marina is 2.2 mi (3.5 km) away. Hotel was ok First room stunk of mould. Complained and they moved us to a waterview room which was fine. 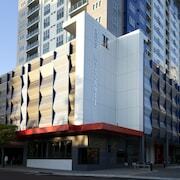 Located in Darwin City Centre, this hotel is within a 10-minute walk of Smith Street Mall and Darwin Waterfront. Cullen Bay Marina is 1.9 mi (3 km) away. 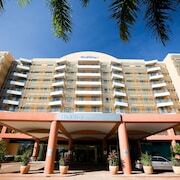 Located in Darwin City Centre, this hotel is within 1 mi (2 km) of The Esplanade and Darwin Waterfront. Cullen Bay Marina is 1.6 mi (2.6 km) away. 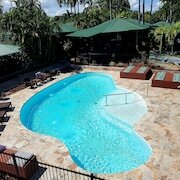 Located in Darwin City Centre, this motel is within a 15-minute walk of The Esplanade and Darwin Waterfront. Cullen Bay Marina is 1.9 mi (3 km) away. 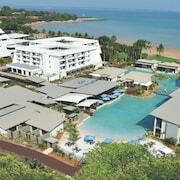 There’s so much to do in Darwin, with the right Darwin hotel you can really live every lastminute! The capital of the Northern Territory is Australia’s one and only tropical city, and it’s packed with activities for nature lovers, adrenaline junkies and nightlife fiends! Take a trip to the gorgeous Kakadu and Litchfield national parks, shop at dusk at Mindil Beach’s super-popular night markets, and indulge in everything from Indigenous art and culture to thumping nightclubs and lovely relaxing gardens. 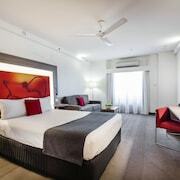 We have Darwin accommodation for solo trekkers, family trippers, honeymooners or BFFs, so make your move and book now for a fabulous time in Darwin. In Darwin, even the shopping is an icon! Mindil Beach Sunset Markets are a place to pick up a one-of-a-kind souvenir by a local artist and sit on the sand and chow down on succulent Asian food as the sun goes down. You can admire bona fide Indigenous art both in Kakadu National Park and in Darwin itself, in the Museum and Art Gallery of the Northern Territory. This awesome museum / gallery is a fascinating place to learn all about Darwin and the NT. Love wildlife? You can see a whole range of animals – including saltwater crocodiles – at the Territory Wildlife Park. And if you’re a croc lover, Crocosaurus Cove is perfect! Test your courage by being lowered into a pit of ‘em in a transparent cage. Darwin has another surprising attraction: its buzzing nightlife. There are clubs, pubs and bars to suit you however you like to spend a Saturday night. Book one of our cheap flights to Darwin! Getting around Darwin is no drama. You can hire a car or take a tour to some of the more remote spots like Kakadu or get around Darwin by bus (including the “tour tub” service), cab or your own two feet.